A professional 900W transformer for large systems - accommodates very long (or heavily loaded) wire runs! Multi-Tap 12V-22V - for very long wire runs! 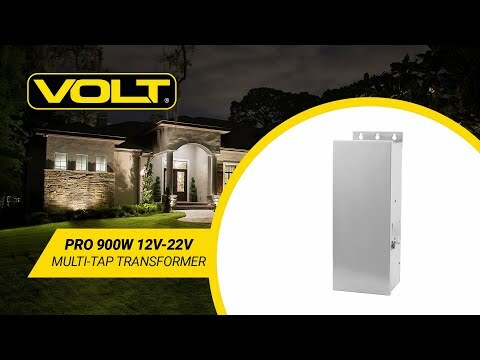 VOLT® 12-22v Landscape Lighting Transformers feature top-of-the-line internal and external components for professional results and commercial reliability. Truly the perfect solution for large landscape lighting systems - especially those with very long (or heavily loaded) wire runs. The extremely reliable, efficient, and quiet toroidal magnetic core lasts a lifetime. The transformer also runs cooler than conventional laminated magnetic types. The solid stainless steel body further ensures that this transformer will never corrode. The 12 to 22 volt taps provide the ability to compensate for voltage loss. For example, using the 22 volt tap, you could install up to 60W of LED lights with a wire run of 600 ft. of #10/2 cable! (Note - we don't advise planning for such long runs - better to relocate your transformer). 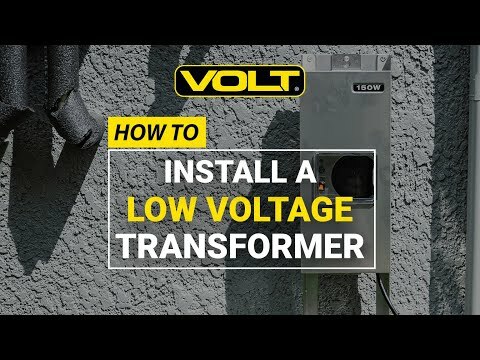 The 22-volt tap also allows you to increase your transformer load on shorter runs. For example, with a 150 ft. run using #10/2 - you can load up to 140W of LED lights. Stainless steel enclosure with hinged, lockable door and removable bottom panel for easy wiring. Timer and photocell ready ports (timer and photocell not included). Toroid core--runs cooler, quieter, more efficient, lasts longer. Only draws as much electricity as needed to illuminate the bulbs you have -- e.g. a 1200w transformer will only draw 400w of power if you only have 400 watts of bulbs hooked to it. Guidelines suggest never loading the transformer to more than 80% of capacity (720 watts for this model). Built-in stainless steel mounting bracket. Includes a 5 1/2ft line voltage power supply cord. Not designed to be hardwired or for use with an extension cord, doing so will void any warranties. Top Mounting bracket 1 1/4" tall, 3 keyholes, bottom mounting bracket 5/8" tall, open keyhole. E.g. 6 runs on a 300w, 12 runs on a 600w, 18 runs on a 900w, 24 runs on a 1200w transformer!